Ryan Parks is a mixed-media artist, music producer/performer, and CEO/founder of critically robust cassette tape label, Harsh Riddims. He was born in College Park, GA and grew up skating all around Atlanta, soaking up the dense kaleidoscopic cultural ooze found both in and outside the perimeter of Atlanta. Aside from his visual practice, which usually takes shape as mixed media (Jacob Lawrence/Matisse inspired maybe) collage, he has been releasing music as Fit Of Body for seven years. Fit Of Body crafts soulful house ballads that draw on freestyle, bell hooks, old school Detroit techno, jazz, and southern rap passed through a no wave paradigm. Fit Of Body has previously released work on CGI, DKA, Ransom Note, and his own label, Harsh Riddims. 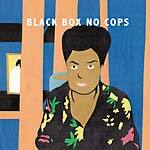 Black Box No Cops is Fit Of Body's debut 2MR release, named for Atlanta hallowed skate grounds, Black Box. Ryan on Black Box: "Black Box, or Black Blocks (I grew saying the latter) is on the corner of Baker and Piedmont in downtown Atlanta. I spend a lot of time skating there. Sometimes there are other people skating there, sometimes not. I prefer it when there are other people at the blocks. Black Box is a cop free zone, you cannot be kicked out."